This is the second part of an analysis of the infamously profane sorority girl’s primer on socialization and community building. If you haven’t read it, you’ll need to spend a couple of minutes at the link to digest it before this post will make much sense. Here’s the first part of the analysis. A Mathbabe post claiming that anonymity in Facebook is necessary for privacy motivated it. Newsflash: Anonymity has always been a delusion that is motivated by fear and insecurity. Double Newsflash: You are always being watched and your behavior is always being judged. We want to believe that we can stand in the corner at the party, not interact appropriately and perhaps nobody will notice. It’s not hard from there to convince ourselves that there’s no need to go to the party. Enough fear and insecurity and there’s no party. Socialization Lesson 1 (from Primer:) Get over your delusions of anonymity and behave as if you know you are being watched. You’ll overcome your fears, your behavior will improve, the community will be stronger for it, and you’ll enjoy life more. If you participate in a small community there are no anonymous interactions – in the public square or anywhere else. People are watching you, collecting information on you, and sharing it with others. They probably won’t share this information with you. Community Building Lesson 1 (from Primer:) If you want to be able to socialize, keep your behavior within standards set and enforced by the communities that you are interacting with and representing. Otherwise, expect to be “punted.” If standards are not enforced, those communities will become dysfunctional or die. Community Building Lesson 2 (from Primer:) There are separate and sometimes much lower standards of behavior set and enforced within the privacy of a single, smaller community – families and small groups. At the same time, expectations for caring and compassion can be much higher. People get to know each other and develop trust within the community. Actions are less likely to be misinterpreted. With this trust, people feel more comfortable sharing their emotions, expressing their needs and building a loving, caring community. A profane rant might be acceptable within the small group but not externally. Socialization Lesson 2 (from Primer:) Love trumps integrity. When our personal integrity conflicts with community standards of behavior, the loving community generally wins. Our behavior will depend on the situation and the audience. Should we eat meat sacrificed to idols? The Apostle Paul explained to the Corinthians (1 Cor 8) that he personally had no problem with the practice. However, if community standards did not permit it, he didn’t see the issue as worthy of dividing or destroying the church. He wouldn’t eat it. The sorority president implores her community not to concern themselves with sportsmanship (integrity) if their team commits a foul or breaks a rule. Just keep cheering for the team. If you don’t support it when a bit of poor sportsmanship is displayed, trust will erode and the community will become dysfunctional or die. Many “real-life” organizations are suffering because their members just don’t get this message. The national leaders of the Delta Gamma fraternity that decided to “punt” the sorority president are unfortunately among them. Community Building Lesson 3 (from Primer:) Group privacy is essential. Standards of behavior that protect it must be enforced. Otherwise, the loving caring communities described in Lesson 2 cannot exist. Trust and intimacy will never form. Communities will wither and die. Community Building Lesson 4 (from Primer:) Anonymity permits one whistleblower to destroy a community. You cannot enforce behavior standards needed in CB Lesson 3 when people have no fear of retribution through anonymity. The loving, caring communities described in CB Lesson 2 cannot form if members fear anonymous whistleblowers. But, oh, no, boo hoo, I’m sad, I hear you crying into your computer screen. Won’t the leaders of these communities become powerful and corrupt? Then won’t they abuse us? Yes, they ……. will. That’s why a community has to work hard to build and maintain governance structures that limit abuses while preserving community. Relying on the fear of whistleblowers is not a substitute and will destroy or neuter the communities that most people need. 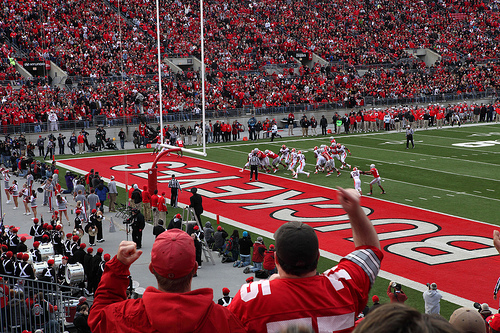 Edit: 22 May 2013 14:38 EDT: Photo changed from Wisconsin fans to Ohio State fans. A couple of weeks ago a now infamous profane email rant from a sorority girl to her sisters went viral on the Internet. The e-mail is full of insights into leadership, governance, socializing, coaching, and crisis management that we’ll delve into below. There’s a follow-up post to this describing her approach to socializing and community building and analyzing anonymity and privacy through that lens. Where to start? I’d suggest reading the e-mail a few times. Try to see the world through the president’s eyes before reading my deconstruction below. I wasn’t part of Greek life in college but I have held several leadership positions that required cajoling college students to show up at extracurricular activities. It’s frustrating and my efforts have generally been unsuccessful. I can feel her pain even though I’m not Greek. I read the e-mail as a coach’s pregame rant. She’s coaching “social skills,” her troops have a game tonight, and she doesn’t think they are quite ready to play – “so far.” She seems to have put a lot of work into organizing and policing the week’s events and wants tonight’s “dry” mixer with the matchup fraternity to be a success. 1. Show no disrespectful behavior to the people with whom they plan to socialize. Don’t get caught up trying to impress someone with social plans so much that you make others feel rejected. 2. Make sacrifices and bind together as a fun-loving group that everyone finds desirable. Show up with the right attitude, ready to have fun. 3. Support the team you’re on and cheer for it. People want to be part of a cohesive group. 4. Promote sober co-ed socializing. 5. Act in ways that make people like you. See 1, 2, and 3 above. No matter how you read it, she wants her troops to succeed and emphasizes what that means – everyone showing up at tonight’s event with their game faces on and ready to play. She cares about them and understands that the reputation of the group depends on how they project themselves externally. She is comfortable communicating with them in crude terms because she trusts them and feels it’s the best approach for venting her frustrations and anxieties while eliciting what she considers appropriate social behavior. In the dark ages, my college friends and I found profane rants enjoyable. I have no doubts that hers was well within the boundaries of acceptable behavior internal to the sorority. She’s betting those not yet fully committed to the mixer will respond to the rant by showing up with their game faces. She’s probably right – her troops will not disappoint. She’ll get results that most others, including myself, cannot. When the sorority sisters socialize successfully at the “dry” mixer, they’ll gain respect for themselves, not lose it. She closes the e-mail by noting that some people might consider it offensive. She clearly expects that nobody in her chapter will take it that way or identify with the “awkward” behaviors described. She trusts them so much that she’s blind to the risks of sending the e-mail. Then Judas tosses her under the bus, sending the e-mail to an internet site and she’s forced to resign. It’s not clear if Judas is a sister or someone outside the sorority that a naïve sister trusted with the forwarded e-mail. It’s also not clear whether the sister’s saw the love in the e-mail that the author may have intended. Many outside the chapter see it as abusive. I don’t think you can make the call unless you are in the chapter and are intimately familiar with their behavioral standards and norms. The next time you enjoy a nice concert, watch a team-based sporting event or read about military actions realize what it takes to get people to work together for a common goal. For many, it means having a coach in your face willing to point out mistakes, develop grueling practice routines and ask for more effort – passionately. It’s hard to lead and motivate. People respond in different ways. Lots respond positively to the “tough love” shown in this e-mail. Looking back, I needed a “social skills” coach willing to confront me every time I engaged in destructive interpersonal behaviors. Is there any better way to learn and grow? I stayed away from the fraternities and rarely encountered anyone who confronted me about my destructive social behaviors. This e-mail prompted my first serious reevaluation of my decision not to participate in Greek life in over 30 years. I never realized what the Greeks might have to offer. I’m still puzzled about why they punted the chapter president and disavowed the e-mail in a public statement instead of providing some context and owning it. In the statement, they contend that the “email should not be depicted in any way as standard or routine or tied to any official sorority voice.” This just doesn’t pass the snicker test. Seems like it will be difficult to convince potential recruits that the sorority will support them when they screw up. Somebody at the national headquarters needs to reflect on the sister’s point about the importance of knowing what team you’re on and supporting it – even when they exhibit a bit of poor sportsmanship. If I had written the e-mail, I hope I wouldn’t feel ashamed of it. She doesn’t appear to call out identifiable individuals for “awkward” behavior. Everybody knows that college kids can be profane. By my reading, she seems to be caring rather than abusing. I would give her the benefit of the doubt until I got the truth from the chapter sisters who should have been responsible for punting in the unlikely event that it was necessary. In terms of crisis management and public relations, governance mechanisms failed not only this chapter but also the entire fraternity. An opportunity to explain Greek system values to outsiders was lost and a public relations disaster for the sorority ensued. Fear triumphed over love. I hope that the game isn’t over. Maybe cooler heads will see reality and love will prevail in the end. Edit 4 May 2013 10:50 EDT: Some references to the sorority girl acting as chapter president have been removed. It’s not clear to me what leadership roles she played within the chapter. Edit 21 May 2013 14:35 EDT: Picture changed from Wisconsin fans to Ohio State fans. After the elimination of the military draft in the U.S., voting is one of the few acts that binds us a community – especially at the national and state levels. Voting is a statement that we care to belong. Leaders elected by votes of a small minority of the group understand that they may have minimal support for their actions and govern accordingly. Rival groups may sense that weakness and act accordingly. John Lennon asked us to “imagine” a world without nations, religion or any reason to fight and die. Could such a world have any groups or even families? I suspect not. It would quickly die out. 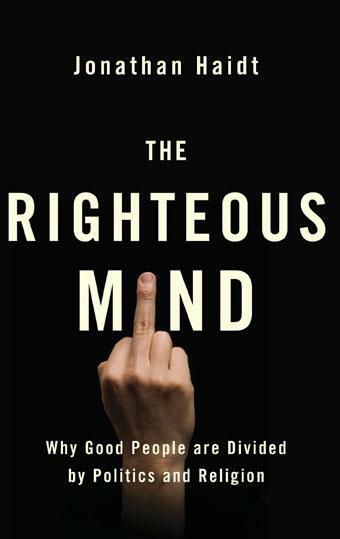 Establishing and maintaining a moral social order typically involves acts that puzzle rationalists – belief systems for religions, hazing/indoctrination rituals for fraternity/sororities, sports, etc. The trick is finding healthy ways to bind groups without accepting bullying authoritarianism or demonizing other groups. Voting is one way. Steve Waldman at Interfluidity has a rationalist take on “Why Vote” that motivated this post. 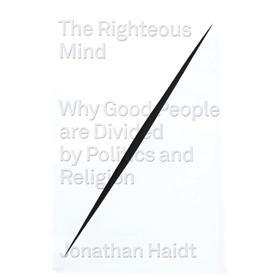 Jon Haidt’s book “The Righteous Mind: Why Good People are Divided by Politics and Religion” makes a similar argument about group binding with Lennon’s “Imagine.” I’m planning to review the book and Haidt’s “Moral Foundations Theory” in the near future. His work influenced this post. Would New Financing Models Produce Useful Higher Education Reforms? Problems with rapidly increasing student loans, a poor job market for recent graduates and new for-profit competition for the education dollar are generating interesting ideas for educational reform. Is coming of age through a higher educational experience worth a huge debt burden that will stay with you even after bankruptcy? Recent news reports of those with unpayable student debts will be giving some second thoughts about maxing out their student loans and living it up on the leftover “refund” checks after they pay their university bills. Like home ownership, for some, college education may not even be necessary to achieve the American Dream. From a financial standpoint, a university diploma will be well worth the cost for many students. Others with college degrees will work lifetimes in dead-end jobs and have little to show for the time and money invested in education. Results will depend on the effort put forth, the quality of the institution, and the demand for the skills obtained. Default rates are much higher at for-profit institutions than others. Those who default damage their credit and lose many potential job opportunities. For the 20% who eventually default on student loans, the price of a college education may well be too high. Unfortunately, at 17, many are not in a position to assess the costs and opaque benefits of higher education. They depend on institutional representatives for help. In many cases, especially at the for-profits, there are substantial government-backed incentives for selling services that might not be in the best interests of the student. Could financing education with claims on future earnings instead of debt help align the college’s incentives with the student’s best interests? Adam Levitin and Yves Smith have recently suggested such an approach. With an equity stake, colleges would accept a percentage of enhanced future earnings for a set number of years rather than proceeds from student loans as payments. This could reduce the institutional incentive to enroll students unlikely to benefit financially from education and reduce the number now saddled with difficult to repay student loans. Over 50 million U.S. student loan balances averaging $17,000 total roughly one trillion dollars. This student loan debt now exceeds the total credit card debt of the nation. The distribution of loan amounts is highly skewed with a median amount of just $12,000. These are current balances on the debts and many have paid the balances down over several years. Over 25% of the 1.6 million Bachelor’s degree recipients from 2008 borrowed over $30,000 and 15% (240,000) borrowed over $40,000. Payments are roughly 1% of the original loan balance each month for 10 years. Therefore, each year, 400,000 graduates will owe over $300 on student loans each month for 10 years. That’s more than a car payment, but without the car. If the rates double in 2013 from 3.4% to 6.8% as suggested in the President’s proposed budget, the payments would increase by 17%. Presumably, the problem loans have the highest values. While it’s hard to get good student loan statistics, a large chunk of the 22-35 year olds in the US must be struggling with this debt because 9% of U.S. student loans are currently in default, 20% eventually default and 63% will get behind on payments at some point. Default rates vary widely by schools with by far the worst rates coming from the for-profit sector. While equity financing seems like a reasonable way to align institutional incentives and to reduce the debt burden, it would drive massive changes in education with consequences that might not be in the best interest of society. With equity financing, we would expect the greatest educational benefits to flow to students most likely to succeed financially rather than to those who succeed academically. Institutions would push vulnerable students into programs where they would produce the highest income. Programs that couldn’t attract or produce high earners would be defunded and eventually die. Directly rewarding universities based on their ability to attract high earners would radically redistribute funding toward top-tier schools. Those catering to the low-earners wouldn’t get resources and would eventually “reform” by changing their target audience or die as well. What’s wrong with that? A lot. Many youth already define their worth by the size of their paychecks. We don’t need additional institutional pressure in this direction. They get enough from their peers. Doling out education to those most likely to be able to generate high paychecks will increase the already too wide income and wealth gaps. Most of the programs that generate high-income graduates benefit from government-enforced licensure and other market distorting influences. Equity financing would provide one more distortion benefiting those permitted to run such programs. It seems unlikely that equity-financed students would be able to choose a field independent of their ability to repay the costs. There would be too many incentives for institutions to move easily influenced students toward more profitable programs and restrict or eliminate others. Still, fraud and other problems associated with government-backed student debt are very similar to those associated with government-supported housing loans several years ago. We’re in the middle of an “education debt bubble.” If it continues to grow the inevitable crash will affect society and the education sector in much the same way the 2007 bursting of the housing bubble devastated the housing sector and created economic difficulties for much of society. Continuing to finance higher education with almost unlimited government-supported student debt is not an option. In the short-term, we should consider measures to share the risks of loan default between lenders, students, and educational institutions. Everyone needs to have “skin” in the game; otherwise, the incentives for predatory lending, “deadbeat” students, and sham educational institutions will erode trust in the entire system. This will reduce total educational funding substantially. There seem to be few realistic alternatives at this point. Schools with the highest student loan default rates should absorb the bulk of the funding reductions. Much of the for-profit education sector would disappear if government-supported student loans carried reasonable restrictions and shared penalties for default. Others with high default rates would feel the pain as well. To the extent that it affects institutions providing legitimate services to those who might otherwise create a burden on society, states might replace some lost funding with tax revenues. Despite my concerns about an all-encompassing equity-funding model, we might experiment with it in specialized licensure programs with rigorous admission standards that produce high earners. This wouldn’t have much impact beyond the students in such programs. Limiting equity financing to specialized fields seems unlikely to redistribute money to programs and schools that attract high earners. It seems fair to trade a piece of a medical other licensed professional income stream for state-enforced laws prohibiting competitors without licenses. This is especially true when the supply of licensed professionals is restricted so much that salaries become grossly inflated. Health care is a good example. The American Medical Association and accreditation councils strictly control the supply of physicians and other health care professionals. The lack of competition allows physicians and medical specialists to charge higher prices. Since medical education is very expensive, equity financing would eliminate some of the largest and potentially problematic student loan balances in the system. In the longer-term, we need to undertake root and branch educational reform at all levels. To some extent, reform being forced upon us with alternative educational delivery and certification models. For those of us mired in the past, we’re still designing educational programs that we hope will meet societal needs then recruit students into these programs. Too often, these students are unprepared for the programs, the institutions don’t remediate, and students either fail or lack basic skills that their credential suggests that they have. Potential students need good honest advice about how they can help society with the skill sets they possess and can develop. High school guidance counselors, parents and teachers are relatively independent but generally don’t know enough to give useful career advice. University counselors, professors and administrators are more knowledgeable but have incentives that often conflict with the interests of the student. Most students end up driven into mass-produced education and careers by their fears. If we moved from a mass production model of education to a mass customization model, then we would focus on the needs of each student and not institutional programs, credentials and ratings. I’d like to flesh out such a model in a future post. For now, I think one key to mass customization in education and career planning is advising. Starting in adolescence, we need to give people frequent, meaningful individualized feedback on skillsets they have, how these skills relate to potential career choices and interests, and how to develop the knowledge and abilities needed to pursue those interests. Accessible educational options are also needed for mass customization success. A large chunk of the population would have to provide these options. I’m thinking broadly of apprenticeships, mentoring, writing seminars, and other skill-building activities available to relatively few students today. Most communities don’t facilitate this type of interaction. Christopher Alexander’s thoughts on community building would be a step in the right direction. I would appreciate any ideas or useful references related to mass customization in education. My thoughts are sketchy but I’d like to try to post on the topic. Update 1: May 18, 2012. Provided more definitive student loan statistics from the Progressive Policy Institute and finaid.org.